ABSTRACT. The extracellular Ca2+-sensing receptor (CaSR) plays an essential role in extracellular Ca2+ homeostasis by regulating the rate of parathyroid hormone (PTH) secretion and the rate of calcium reabsorption by the kidney. Activation of the renal CaSR is thought to inhibit paracellular divalent cation reabsorption in the cortical ascending limb (cTAL) both directly and indirectly via a decrease in NaCl transport. However, in patients with autosomal dominant hypocalcemia (ADH), caused by CaSR gain-of-function mutations, a defect in tubular NaCl reabsorption with renal loss of NaCl has not been described so far. This article describes a patient with ADH due to a gain-of-function mutation in the CaSR, L125P, associated with a Bartter-like syndrome that is characterized by a decrease in distal tubular fractional chloride reabsorption rate and negative NaCl balance with secondary hyperaldosteronism and hypokalemia. The kinetics of activation of the L125P mutant receptor expressed in HEK-293 cells, assessed by measuring CaSR-stimulated changes in intracellular Ca2+ and ERK activity, showed a dramatic reduction in the EC50 for extracellular Ca2+ compared with the wild-type and a loss-of-function mutant CaSR (I40F). This study describes the first case of ADH associated with a Bartter-like syndrome. It is herein proposed that the L125P mutation of the CaSR, which represents the most potent gain-of-function mutation reported so far, may reduce NaCl reabsorption in the cTAL sufficiently to result in renal loss of NaCl with secondary hyperaldosteronism and hypokalemia. The extracellular Ca2+-sensing receptor (CaSR) plays an essential role in extracellular Ca2+ homeostasis by regulating the rate of parathyroid hormone (PTH) secretion and the rate of calcium reabsorption by the kidney (1,2). The physiologic importance of this receptor in determining the extracellular calcium concentration has been documented by the characterization of human syndromes resulting from gain or loss-of-function mutations in the CaSR gene. When present in the heterozygous state, loss-of-function mutations cause familial hypocalciuric hypercalcemia (FHH, OMIM 145980), whereas in the homozygous state, these mutations cause neonatal severe hyperparathyroidism (NSHPT, OMIM 239200) (3,4). In contrast, gain-of-function mutations are responsible for a form of autosomal dominant hypocalcemia (ADH, OMIM 601198) (5). The CaSR is a member of the G protein-coupled receptor (GPCR) family and belongs to subfamily 3, which is characterized by a large amino-terminal extracellular domain (6). The CaSR functions as a dimer, with dimerization occurring through interactions of the cysteines of the extracellular domain (7). The CaSR signals via pertussis toxin-sensitive and -insensitive G proteins (Gi and Gq/11 families) to regulate second messengers that include cAMP, inositol triphosphate, diacylglycerol, intracellular Ca2+, and arachidonic acid (AA) metabolites (1). These second messengers presumably regulate kinases, phosphatases, and other signaling molecules. Like many GPCR that act through Gi and Gq/11, the CaSR stimulates mitogen-activated protein kinase (MAPK) signaling cascades, particularly the extracellular signal-regulated kinases (ERK) subfamily (8). In the kidney, the CaSR is primarily expressed on the basolateral cell surface in the cortical thick ascending limb (cTAL) but is also expressed in most tubule segments (9–11). Activation of the CaSR by hypercalcemia, hypermagnesemia, or gain-of-function mutations inhibits divalent cation reabsorption in the renal tubule, which results in urinary loss of Ca2+ and Mg2+ (6). This tubular effect takes place primarily in the cTAL, where divalent cation transport is mainly (if not exclusively) passive, and occurs via the paracellular pathway (12). Inhibition of Ca transport has been attributed to a selective inhibition of paracellular permeability and to a reduction of the lumen-positive transepithelial voltage, secondary to a decrease of transcellular NaCl transport (6). Patients with ADH present with hypocalcemia, hypomagnesemia, hypercalciuria, and polyuria, but a defect in tubular reabsorption of NaCl in TAL resulting in renal loss of NaCl has yet to be reported. Here we report the case of a patient with ADH due to a CaSR gain-of-function mutation, L125P, associated with a decrease in distal tubular fractional chloride reabsorption, and a renal loss of NaCl with secondary hyperaldosteronism and hypokalemia, mimicking a Bartter syndrome. We compared the kinetics of the wild-type CaSR, the CaSR bearing the L125P mutation, and the CaSR bearing a novel loss-of-function mutation, I40F (detected in a patient with FHH) in vitro using two different signaling pathways. The L125P mutant is the most potent gain-of-function mutation described to date, which may be the reason why NaCl reabsorption in the cTAL was decreased sufficiently to result in renal wasting of NaCl and a Bartter-like syndrome. Peripheral blood samples were obtained after informed consent from the two probands and from the parents and sister of proband 1. Genomic DNA was extracted by standard methods (13). The whole CaSR gene was amplified with specific primers described elsewhere (3). These amplified products were purified on 1.5% agarose gels and sequenced directly using a dideoxy-cycle sequencing protocol (according to the manufacturer’s instructions) in the presence of specific primers together with fluorescence-labeled dideoxy-terminators and an Applied Biosystems DNA sequencer (model 373A). For the parents and sister of proband 1, direct sequence analysis was performed only of the DNA region containing the corresponding mutation. The DNA of the parents of proband 2 was not available. The absence of these mutations in 50 normal controls was verified by SSCP analysis as described (14). The human CaSR cDNA construct subcloned in the pcDNA-3 vector has been described (15). Site-directed mutagenesis was performed using the QuickChange Site-Directed Mutagenesis kit (Stratagene Inc., La Jolla, CA), according to the manufacturer’s instructions. The primers as follows: L125P mutation, 5′ GAT TCT TTG AAC CCT GAT GAG TTC TGC 3′ and 5′ GCA GAA CTC ATC AGG GTT CAA AGA ATC 3′; I40F mutation, 5′ GGC TCT TTC CTT TTC ATT TTG GAG TAG C 3′ and 5′ GCT ACT CCA AAA TGA AAA GGA AAG AGC C 3′. The incorporation of the mutations was confirmed by direct sequencing. HEK-293 cells were cultured on glass coverslips in DMEM supplemented with 25 mM HEPES and 10% fetal calf serum in a 7% CO2 incubator. The receptor constructs were prepared using the Qiagen Plasmid Maxi DNA preparation kit (Qiagen Inc., Chatsworth, CA). For transient transfection, cells were divided such that they were 70% confluent at the time of transfection. Cells in 30-mm dishes were cotransfected using the calcium phosphate method with 1.5 μg of DNA of a CaSR construct and 1.5 μg of the GFP-N1 plasmid (Clontech, Palo Alto, CA) without an insert. HEK 293 cell membranes were prepared by homogenization in a buffer containing 10 mM Tris-HCl (pH 7.8), 1 mM EDTA, and protease inhibitors and brought to a final concentration of 30 mM NaCl and 2 mM MgCl2 and centrifuged at 250 × g for 2 min. The supernatant was centrifuged at 23,000 × g for 10 min; the pellet was resuspended in the same buffer, and the protein concentration was measured. Samples containing equal amounts of protein were subjected to sodium dodecyl sulfate- polyacrylamide gel electrophoresis (SDS-PAGE) and transferred to nitrocellulose. The nitrocellulose membranes were blocked with blotto and blotted with a monoclonal anti-CaSR antibody (16), at a dilution of 1:400. The blots were visualized with the enhanced chemiluminescence system using the horseradish peroxidase (HRP)-conjugated anti-mouse secondary antibody at a dilution 1:40,000. Cells were grown in 96-well trays. The tissue culture medium was removed, and the cells were incubated with the anti-CaR antibody in phosphate-buffered saline (PBS) for 1 hr. The cells were washed with PBS. The cells were then incubated with HRP-conjugated anti- mouse IgG and washed, the substrate was added, and the plate was read in an enzyme-linked immunosorbent assay (ELISA) plate reader at 405 nm. Controls included cells known to express the CaR, nontransfected cells, and omission of the anti-CaR antibody (16,17). Thirty-six hours after transfection, the coverslips were placed in calcium-free DMEM. Forty-eight hours after transfection, the cells were loaded with Fura-2 AM (Molecular Probes, Eugene, OR) in Ringer solution (140 mmol/L NaCl, 4.5 mmol/L KCl, 0.5 mmol/L MgCl2, 20 mmol/L TES, pH 7.4) for 30 min at room temperature. Fura-2-loaded cells were washed and placed in a UV-grade fluorometer cuvette on a fluorescence spectrophotometer (Chroma Technology, Brattleboro, VT). They were then exposed to increasing CaCl2 concentrations. The CaSR-induced increases in intracellular Ca2+ levels were determined by measuring the emission ratio (340/380) excitation of single cells, using the Metafluor 3 and 3.5 software (Universal Imaging Corporation, West Chester, PA). Only the cells expressing green fluorescent protein (GFP) were analyzed. The changes in intracellular Ca2+ levels were expressed as a normalized response. The magnitude of the transient response peak after an individual stimulus was added to the sum of the counts from the previous stimulus and expressed as a proportion of the total counts in the concentration-response curves, as described by Pearce et al. (18). Individual EC50 values (the effective concentration of extracellular Ca2+ giving half of the maximal response) for each incremental, normalized concentration-response curve were plotted using the Sigma Plot software (SPSS, Chicago, IL). The mean EC50 values from three different experiments were compared by an ANOVA test. P < 0.05 was considered significant. HEK-293 cells were transiently transfected with the CaSR cDNA constructs in pcDNA3. After approximately 36 h, the cells were serum-deprived overnight. At the time of experiments, the medium was replaced with a solution containing 140 mM NaCl, 5 mM KCl, 10 mM HEPES (pH 7.4), 1 mM CaCl2, and 0.5 mM MgCl2. At time 0, Ca was added at the concentrations indicated and incubated with the cells at 37°C for 5 min. The reactions were stopped by rinsing the cells at 4°C in buffer containing 50 mM NaF, 100 mM NaCl, 0.1 mM Na orthovanadate, and 20 mM Na H2PO4 (pH 7.4 to 7.5), and placing the dishes on a dry ice and ethanol bath. The cells were scraped in iced buffer that contained 50 mM Tris (pH 7.5), 50 mM NaCl, 5 mM EDTA, 1 mM EGTA, 1 mM Na orthovanadate, 40 mM glycerophosphate, 50 mM NaF, 50 nM okadaic acid, 5 mM Na pyrophosphate, 1% triton X-100, 0.5% Na deoxycholate, 1% SDS, 40 mM pNPP, 4 μg/ml pepstatin, 4 μg/ml aprotinin, 4 μg/ml leupeptin, and 1 mM PMSF. The cell lysates were centrifuged at 15,000 × g for 10 min in a refrigerated microfuge. Triton-soluble extracts were normalized for protein, size fractionated on a 9% SDS polyacrylamide gel (30:0.6 acrylamide:bisacrylamide with 0.75 M Tris [pH 8.8]) and immunoblotted with an anti-active ERK antibody (Promega, Madison, WI). The bands were quantified with scanning densitometry and NIH image software (Scion Image, Frederick, MD) (15). Case 1 is a male child born at 37 wk of gestation to nonconsanguineous parents. At 3 wk, severe hypocalcemia (total Ca concentration, 1.54 mmol/L) and hyperphosphatemia associated with a nonadapted serum 1–84 PTH (<10 pg/ml) were discovered. The diagnosis of neonatal hypoparathyroidism was made. Treatment with calcium and vitamin D improved the hypocalcemia. At age 7, during an episode of severe hypocalcemia (convulsions and electrocardiographic disturbances), the patient presented with polyuria (urine volume 2.2 L/d) and the laboratory data shown in Table 1. Increased doses of vitamin D resulted in a marked hypercalciuria. The diagnosis of Bartter syndrome was made. Treatment with indomethacin and supplementation with magnesium, calcium, and potassium resulted in normalization of renin levels and partial amelioration of the plasma ion concentration abnormalities and polyuria. At age 9, without indomethacin therapy, metabolic studies were performed; the results are presented in Table 1. Renal echography showed a small stone in the right kidney without nephrocalcinosis. Case 2 is a 45-yr-old man who presented with recurrent nephrolithiasis. He had passed three stones over the past 14 yr. Analysis of the stones revealed a predominance of calcium oxalate. Three years before our evaluation, moderate hypercalcemia was detected (2.61 mmol/L) with a PTH value of 48 pg/ml (normal values are 10 to 58 pg/ml). The results of his serum chemistry are shown in Table 2. In this patient, it was difficult to distinguish between the diagnoses of FHH and primary hyperparathyroidism, but the diagnosis of primary hyperparathyroidism can still be made because the PTH is inappropriately “increased” in the face of hypercalcemia. In proband 1, we identified a heterozygous T to C transition at nucleotide 374 in exon 3 of the published cDNA sequence (Genbank accession number U20759), which resulted in the substitution of leucine by proline at amino acid position 125 (L125P). Exon 2 sequences of the patient’s parents and sister were normal, indicating that this is a de novo mutation. In patient 2, we identified one heterozygous A to T transition at nucleotide 118 in exon 2, which resulted in the substitution of isoleucine by phenylalanine at amino acid position 40 (I40F). The presence of this CaSR mutation in this patient permitted us to eliminate the diagnosis of primary hyperparathyroidism. The SCCP patterns corresponding to these mutations were not observed in 50 unrelated control individuals (100 test alleles). Figure 1 shows an immunoblot of whole cell extracts from HEK-293 cells that were transiently transfected with cDNAs coding for the wild-type L125P and I40F receptors. The receptor is seen as a band at approximately 135 kD and an aggregate at higher molecular weight. Figure 2 shows the results of a cell surface ELISA assay for cell surface expression of the CaSR in which a primary antibody that recognizes the extracellular domain of the CaSR is used (17). The wild-type and I40F mutants are expressed on the cell surface at comparable levels, but the receptor with the L125P mutation, which causes it to be active at normal concentrations of extracellular Ca2+ (see below), is expressed at approximately half the level of the other two receptors. Reduced cell surface expression of the CaSR with the L125P mutation may reflect increased internalization due to its increased state of activation, a characteristic of this class of receptors (19). Figure 1. Expression of Ca2+-sensing receptor (CaSR) protein in HEK-293 cells. Extracts of membrane and cytosolic protein were prepared from HEK-293 cells that had been transiently transfected with pcDNA3 (V), CaSR Wt, CaSR L125P, and CaSR I40F, and equal amounts of extract normalized for protein were immunoblotted with an anti-CaSR antibody. The CaSR is seen as a band at approximately 135 kD and as a high-molecular weight aggregate. Figure 2. Intact cell measurement of cell surface expression of the CaSR. HEK-293 cells transfected with the expression vector (pCDNA3), the wild-type or each mutant receptor, were plated in a 96-well tray that had been coated with collagen. The cells were washed with phosphate-buffered saline (PBS) and incubated with the anti-CaSR antibody that recognizes an epitope in the extracellular domain, washed, and then incubated with an horseradish peroxidase (HRP)-conjugated anti-mouse IgG. The cells were washed and incubated with substrate, and the OD 405 nm measured. The values shown represent the mean of triplicate samples corrected for protein ± SD (Cont, 0.27 ± 0.03; Wt, 0.888 ± 0.017; L125P, 0.553 ± 0.026; I40F, 0.896 ± 0.094). To analyze the kinetics of activation for the wild-type and the two mutants receptors, we transiently cotransfected HEK-293 cells with each of the three cDNAs and measured CaSR-stimulated changes in intracellular Ca2+. The HEK-293 cells transfected with the wild-type CaSR cDNA had a threshold response to extracellular Ca2+ levels between 2 and 3 mM. 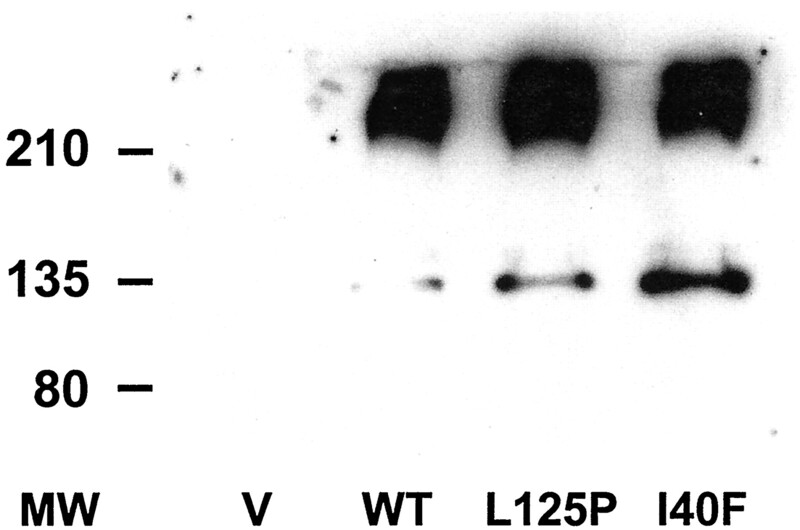 In contrast, as shown in Figure 3, the first detectable response of the L125P mutant receptor is obtained at 0.5 mM. For the I40F mutant receptor, the threshold was greater than 4 mM Ca2+. Figure 4 shows typical dose-response curves for the wild-type and mutant receptors. Compared with the wild-type CaSR, the L125P mutant receptor shows a significantly (P < 0.0001) left-shifted dose-response curve with a reduced EC50 value (0.814 ± 0.072 mM [n = 41] versus 2.69 ± 0.01 mM [n = 123]). In contrast, the I40F mutant receptor shows a significantly (P < 0.0001) right-shifted dose-response curve with an increased EC50 value (4.73 ± 0.18 mM; n = 54). Figure 3. Fluorescence responses of CaSR-transfected HEK-293 cells to increasing levels of extracellular Ca2+ observed in three typical experiments using wild-type or mutant receptor (L125P and I40F). For each increment in extracellular Ca2+, there is a peak in the ratio of the emitted fluorescence counts reflecting concomitant changes in intracellular Ca2+. It can be seen from these data that the threshold for an extracellular Ca2+ response in cells expressing the wild-type receptor is approximately 2.5 mM compared with 0.5 mM for L125P and 4 mM for I40F. Figure 4. Normalized fluorescence response of transiently transfected HEK-293 cells expressing the wild-type receptor or the CaSR containing L125P and I40F mutations to increasing levels of extracellular Ca+2. Each data point represents the mean ± SEM of individual values of three independent transfections. The concentration-response curves show that the EC50 for the mutations are significantly different from that for the wild-type CaSR (P < 0.0001). We used an additional assay, ERK activation, to characterize signaling by the two mutant receptors. HEK-293 cells were transiently transfected with the receptors, and CaR-stimulated ERK activity was measured over the extracellular Ca concentration range of 0 to 12 mM (Figure 5). We found that the EC50 values for Ca for the receptors were: wild-type, 3.2 ± 0.4 mM; L125P, 1.4 ± 0.5 mM; and I40F, 8.1 ± 2 mM. These results are comparable to those for regulation of intracellular Ca and demonstrate with a different assay that the L125P mutation significantly reduces the EC50 value for Ca and that the I40F mutation increases it. Figure 5. Kinetics of activation of extracellular signal-regulated kinases (ERK) in HEK-293 cells that transiently express cDNAs coding for the wild-type and mutant CaSR. HEK-293 cells in 60-mm dishes were transiently transfected with cDNAs coding for the wild-type and mutants receptor. Forty-eight hours after transfection and after overnight serum deprivation, the cells were treated with the Ca2+ concentrations indicated for 5 min., the reactions stopped, cell extracts prepared, and ERK activation was measured by immunoblotting with an anti-active ERK antibody. The immunoblots were quantitated using densitometry and NIH image software (Scion Image, Frederick, MD) and GraphPad Prism software (GraphPad, San Diego, Ca. All results were normalized to the maximum activity of the CaSR wild-type, which was assigned a value of 100%. The values on the x-axis in log (Ca2+) M correspond to 0.32, 1, 3.2, 10, and 32 mM, respectively. In this article, we described the phenotype and biochemical characterization of two mutations in the human CaSR. 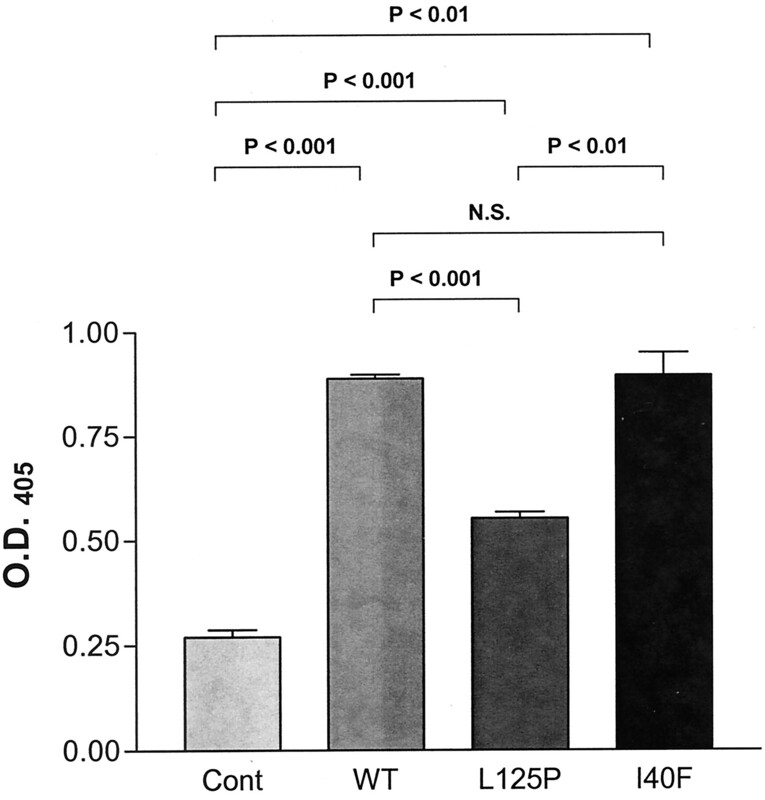 L125P is a gain-of-function mutation that results in ADH associated with a Bartter-like syndrome, and I40F is a novel loss-of-function mutation that results in familial hypercalcemic hypocalciuria. The L125P mutation is of particular interest because, although the CaSR activation has been suggested to inhibit NaCl transport in cTAL (6), gain-of-function mutations associated with a Bartter-like syndrome have not been reported previously. The I40F mutation results in an approximately twofold increase in the EC50 value for extracellular Ca2+. The isoleucine at position 40 is located in the extracellular domain and is conserved in the CaSR of different species. Although this mutation does not change the charge or hydrophobicity of the residue, our results confirm the importance of this amino acid in modulating the affinity of CaSR for extracellular Ca2+. The gain-of-function L125P mutation occurs at a highly conserved residue in the extracellular domain. This site is within the Ala116-Pro136 region, which is of key importance for maintaining the inactive conformation of CaSR (20). Of the 16 activating CaSR mutations identified to date, ten are located in the extracellular domain and five of these are located in the Ala116-Pro136 region. Hauache et al. (21) studied the effects of the calcimimetic compound R-568 on the Ca2+ sensitivity of the CaSR bearing each of the previously described gain-of-function mutations, A116T, L125P, F128L, and F612S. The CaSR bearing the L125P mutation showed activity at 0 mM extracellular Ca2+ and a maximally left-shifted dose-response curve. Neither the addition of R-568 nor the combination with another gain-of-function mutation increased its sensitivity to Ca2+. This phenomenon was not observed for the three other mutations studied. This point is illustrated by comparing the EC50 values of the other gain-of-function mutants to that of the L125P mutant. To compare the results from different studies, the ratio of the mutant EC50 value/wild-type EC50 value for that study is calculated. For the mutants other than L125P, the ratios range from 0.53 to 0.84, but our data for the L125P mutant result in a ratio of 0.3. This analysis demonstrates that the L125P mutation is the most potent gain-of-function mutation described to date and may provide a rationale for the severity of this patient’s ADH and the presence of Bartter-like syndrome. Bartter syndrome is a rare renal tubular disorder, characterized by hypokalemia, metabolic alkalosis, and secondary hyperreninemic hyperaldosteronism with normal BP. In the last five years, the molecular bases of Bartter syndrome have been established. Bartter syndrome is caused by defects in one of the molecules primarily or secondarily involved in transepithelial NaCl transport across the TAL. The antenatal variant of Bartter syndrome, characterized by marked fetal polyuria, polyhydramnios, premature delivery, severe salt wasting, and marked hypercalciuria, is genetically heterogeneous. Mutations in the genes encoding either the luminal bumetanide-sensitive Na+-K+-2Cl− cotransporter (NKCC2) or the luminal potassium channel, ROMK (KCJN1) have been described (14,22–24). Finally, mutations in the CLCNKB gene, which codes for the basolateral renal chloride channel CLC-kb, are responsible for most of the cases of the classical variant, which is characterized by a milder phenotype beginning in infancy or childhood, hypomagnesemia in 40% of cases, and normo- or hypercalciuria (25,26). Recently, a new gene (BSND) responsible for the antenatal variant of Bartter syndrome with sensorineural deafness has been identified (27). This new gene encodes a new protein, barttin, which acts as an essential β-subunit for basolateral ClC-ka and ClC-kb channels (28). Proband 1 presented with all of the features of classical Bartter syndrome. However, we found no mutations in the CLCNKB gene of this patient by direct sequencing. A possible hypothesis to explain the association of a Bartter-like syndrome with ADH is the presence of inhibition of NaCl transport in cTAL by CaSR activation. Two mechanisms have been proposed to account for the inhibitory effect of activating the Ca2+/Mg2+ sensing receptor on passive paracellular divalent cation transport in the cTAL (6). The first is a selective decrease in divalent cation paracellular permeability. The second is a decrease in transepithelial lumen-positive voltage secondary to inhibition of transcellular NaCl transport. In vivo microperfusion of Henle’s loop in thyroparathyroidectomized (TPTx) rats has shown that an acute and selective increase in the peritubular plasma Mg2+ concentration markedly inhibits divalent cation but not NaCl reabsorption (29). Consistent with this hypothesis, acute Mg2+ infusion in humans increases urinary calcium excretion but does not increase urinary NaCl excretion and does not alter the natriuretic response to furosemide (30). However, in vivo microperfusion of Henle’s loop in TPTx rats has shown that an increase in the peritubular plasma Ca2+ concentration induces a small but significant reduction (8%) in NaCl reabsorption with a modest increase in urinary NaCl excretion (31). It has been recently shown that graded calcium infusion in healthy men, under a PTH clamp protocol and rigorously controlled NaCl balance, induces a modest increase in urinary NaCl excretion, with a saturation phenomenon at high plasma calcium concentration (32). Ca2+ is a more potent activator of the CaSR than Mg2+ (6); it is therefore possible that the degree of inhibition of NaCl reabsorption in the cTAL is a function of the magnitude of CaSR activation. In vitro studies suggest that maximal CaSR activation, with calcium or other agonists, may reduce NaCl transport in the TAL by either direct inhibition of the Na+-K+-2Cl− cotransporter or by indirect inhibition of K+ recycling via the apical K+ channels, two mechanisms also involved in the pathogenesis of Bartter syndrome. In rat isolated TAL, it has been shown by using the patch-clamp technique and fluorescence dyes that the CaSR activation induces a reduction in the activity of the apical intermediate conductance K+ channel and a decrease in intracellular Na+, suggesting inhibition of Na+ transport (33). Nevertheless, the K+ channel involved in antenatal Bartter syndrome, ROMK, is a low-conductance channel, and its inhibition by activation of CaSR has not been reported. In rat cTAL microperfused in vitro, CaSR activation induces a 25% reduction of net chloride flux (34). In contrast, in the mouse microperfused cTAL, activation of the CaSR does not impair either NaCl reabsorption or the transepithelial potential gradient (35). Taken together, the in vivo and in vitro experiments and the “experiment of nature” provided by the association of a mild Bartter-like syndrome in a patient with a potent CaSR gain-of-function mutation suggest that CaSR activation of sufficient magnitude is able to induce a renal loss of NaCl secondary to a reduction of NaCl transport in the TAL. The L125P mutation has also been described in a severely affected Japanese neonate as a de novo mutation, but a renal tubular phenotype was not reported (36). It will be interesting to know if this patient or other patients with severe ADH also have Bartter-like syndrome. It may be also interesting to study Ca2+ and Mg2+ homeostasis in other patients with the diagnosis of Bartter syndrome without identified mutations in NKCC2, KCJN1, CLCNKB, or BSND genes. We would like to thank Frederic Huet and Patrick Niaudet for the contribution of patient material. We thank Dr. Vasiliki Kalatzis for critical reading of the manuscript. C. Huang and R.T. Miller were supported by NIH grant DK-41726, the American Heart Association, the Polycystic Kidney Disease Center at Rainbow Babies and Children’s Hospital, and the Leonard Rosenberg Research Foundation.